A patient story as told by Dr. Goran Jovic. At first, I did not notice anything unusual about him. I was on my way to the operating room. That’s when a young man in technician’s overalls stopped me. He asked, ‘Are you Dr. Goran Jovic?’ When I replied, ‘Yes. Yes I am,’ the young man’s face lit up! He explained to me that when he was four years old, he fell into a basin of boiling water. Following the accident, his mother rushed him to see the nearest doctor. The local doctor attempted to treat the severe burns Joseph sustained on both of his forearms. Unfortunately, in order to prevent contractions of the skin, many burn injuries require suturing. They require reconstructive surgery. Like many burn survivors living in Zambia, immediately following his accident, young Joseph did not receive reconstructive surgical care. As consequence, the skin where Joseph’s bicep and forearm connect, began to tighten. Eventually, this tightening rendered both of Joseph’s arms useless. With nonfunctional arms, Joseph could not feed himself, use a pencil, or play with his friends. Concerned for Joseph’s future, Joseph’s mother brought him to one of our (ReSurge) surgical sites. Our surgeons released both of Joseph’s elbows. 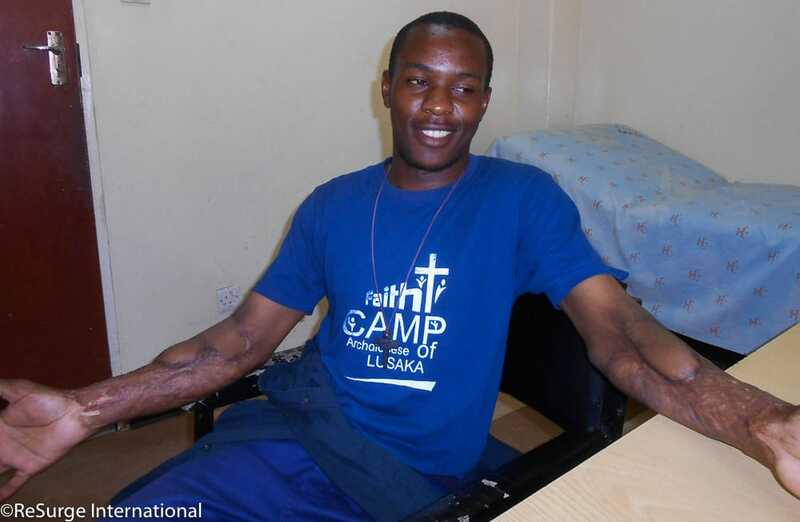 After multiple surgeries, Joseph was able to bend his arms. Seeing the consequences of my work was a great moment. I am so happy and grateful to have met Joseph. Dr. Goran Jovic is the only plastic surgeon in Zambia. In addition to performing surgeries in Lusaka, Dr. Jovic, a pilot, flies to remote areas of Zambia to treat underserved patients. In addition to treating patients, Dr. Jovic strives to help doctors and surgeons in rural areas advance their medical skills and services. Dr. Jovic has been a ReSurge Surgical Outreach Partner since 1993.